This image is of the fossilized remains Inoceramus (Actinoceramus) concentricus clams. 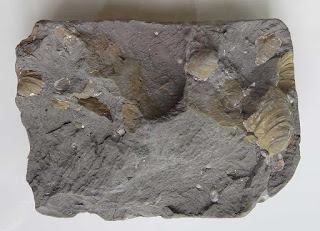 They were found in the Gault clay of Kent England. This layer dates to the Cretaceous Period. Specimen on display in the mineral area of the British Natural History Museum in London on August 2016.